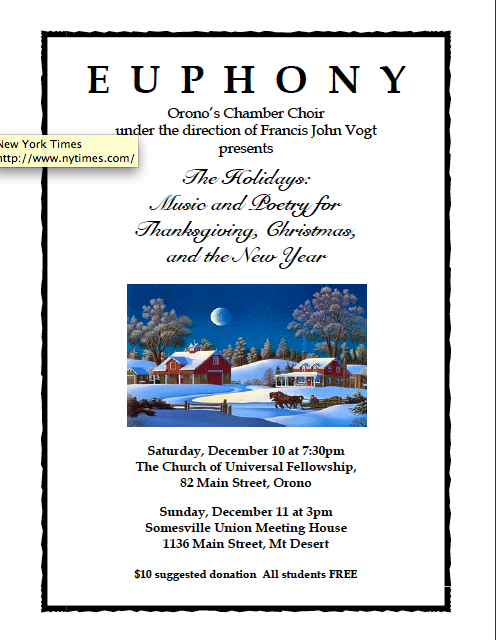 The concerts will take place on Saturday, December 10 at 7:30 p.m. at the Church of Universal Fellowship on 82 Main Street in Orono and on Sunday, December 11 at 3 p.m. at the Somesville Union Meeting House; 1136 Main Street; Somesville, Maine. $10 suggested donation All students FREE! If you haven’t had a chance to hear this remarkable group you’re in for a treat. Take some time out from all the hustle and bustle and let their fantastic harmonies sweep you into the holidays!